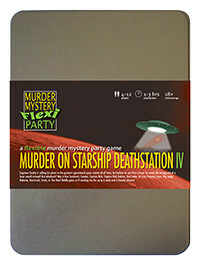 You've been invited to play the role of Dr Foo in Murder on Starship Deathstation IV. The infamous Engineer Snotty has just finished the plans for the greatest operational space station of all time, and now he’s invited all sorts of scum and villainy from the across the galaxy to bid for them. But before the auction can begin, Snotty is found in pieces, literally, on the wrong end of a laser-sword! Can you boldly go and find his killer before they strike back again?! DR FOO is a time travelling alien. Always smartly dressed, sometimes dinner attire, and even with scarf depending how cold it is, Dr Foo is the first female in a long line of travelling Doctors and pretty much looks gorgeous in whatever she chooses. Glasses complete the look. Dr Foo began to time travel at an early age, as early as she can remember being alive at least, and comes from a long line of time travellers. So long, in fact, she no longer really knows where her ‘present’ is, and tends to live for the here and now wherever her Y.A.R.I.S. takes her. Generally considered to be a ‘good’ doctor, Dr Foo often tries to correct history when required, normally with disastrous results. My name is Dr Foo. I’m a time traveller from another universe who has hopped back in time just a little too late to save engineer Snotty. Yes I could wind back a few hours and try again, but then I’d probably run into myself, and there are all sorts of time-space continuum things I’d probably destroy. I’m interested in the plans from a historical point of view but other than that, regrettably Dah Fader and his associates will take over the galaxy with the information in those plans. In this universe in any case.